My Sacramento neighborhood, not far from the confluence of the American and Sacramento rivers, is lush and green. Neighbors on our horseshoe-shaped street care for their yards, and most, like me, do it with the help of gardeners. In summer, it’s dotted with color, beds full of flowers crying out loud. There’s a distinctly California feel to the plantings, although there are foreign and exotic touches. 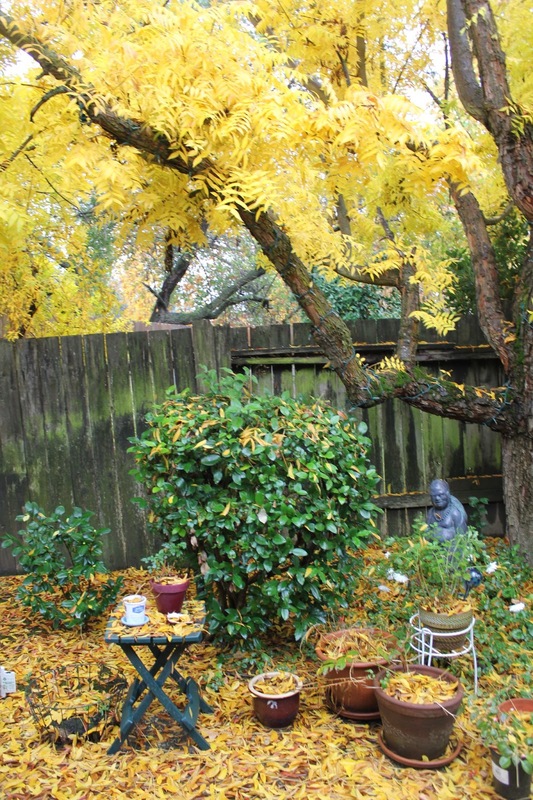 The people down the street have impressive Italian cypress and a few have graceful Japanese maples in their yards. There are magnolia trees and hibiscus. But, many gardens, including mine, are transitioning to drought-tolerant native plants — less showy, more enduring. My fences are rotten and need to be replaced, but I’ve put that project off until I have more time and money. My sons have set new posts and from time to time tacked up new dog-ear planks. They’ve begged me to address the fence problem. But, gaps in the worn out boards offer slivers of life on my quiet street so I’m in no hurry to make repairs, choosing instead to spy on the passing world in my little corner. In summer my crape myrtle blooms magenta, Nile lilies open their white faces and smile with lavender lips at the relentless sun then the blooms clutch into wrinkled fists and drop. Monkey flowers, some would call them weeds, squint their yellow eyes, pop open with amazement at being alive, before fluttering spent petals to the dirt. I’ve created a wild scene of roses, butterfly bush, old-fashioned hydrangea, coreopsis, crowns of thorns and grand sweeps of lavender across my long, street-side bed. I live outside in my garden about nine months out of the year — drinking coffee on the patio, snipping and watering, supervising pests who come to do damage, composing writing in my head. I pace and make up dialog, cuss to myself about structural knots in my writing, make notes, read. My garden is my writer’s studio, my sanctuary, my self-contained world. Way back, along the street side, is my hidden garden — it’s where I put my orphan plants — those too weak or ugly for front and center planting. Some of them survive and find honored places in my yards. I love my orphans, but they’re planted outside the rotten side yard fence and I don’t see them every day. I admit I don’t visit them often enough, which I’ve discovered can cause a lot more than a horticultural problem. Jolted, I read on. The notice said the law requires graffiti be removed “as soon as possible” and “failure to abate such graffiti, and/or pay all related costs (for removal) may result in a Declaration of Public Nuisance being recorded against your property. A lien may also be placed against your property for failure to pay removal costs.” The letter included a color photo of the fence behind my orphan’s garden. I ran outside, halfway down the block, to find this —-. Until I got the letter, I had no idea my fence had been vandalized. But there, among the orphans, cloaked by foliage, back under the blooming crape myrtle boughs, were the cryptic, spray-painted letters. Someone, a passerby, most likely a neighbor, chose to call the authorities rather than talk to me, come to my door the moment they saw it, express regret that I had been victimized, perhaps offer to help repair the damage. Instead they chose to anonymously call in a complaint to the authorities, triggering a trip to my property by a city code enforcement officer, photos taken and archived, a threatening letter sent, and a follow up visit to verify code compliance was made, as well as prompting a visit by the city’s police gang task force. My guess is that this unnecessary waste of city resources, which could have been resolved by simple interaction among neighbors, was initiated by our self-appointed neighborhood watch person. City Code Enforcement advised they received repeated anonymous calls about the graffiti on a few properties in my area, the first instances of it on our block in the city’s history. 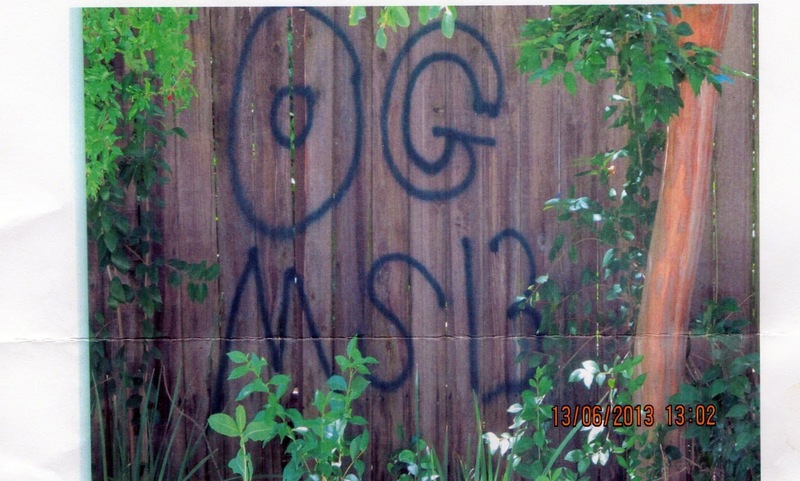 A review by the police gang task force concluded the graffiti was the work of kids, not gangsters. A further check shows many, many other anonymous calls about things amiss in our neighborhood have been made to city agencies in the past few years. If a street basketball hoop goes up, if a car is parked over the curb, if weeds have sprung up in a yard, a broken-down car sits too long in a driveway, a family party goes on too long or a dog barks at odd hours, the city gets repeated anonymous calls. Someone has taken it upon themselves to do this, probably justifying the abuse of resources we all pay with the rational they’re helping maintain property values, especially their own. In light of the Trayvon Martin tragedy in Florida, which raised many concerns and questions about citizen patrols and vigilantism, I wonder about the benefits of self-appointed, over-zealous neighborhood guardians. I wonder if those who make claims about protecting property values and supporting public safety aren’t really more interested in cloaking themselves in borrowed authority, riding roughshod over neighbors, feeling victorious when cop cars roll up and city officials root around in the bushes to take crime photos. I wonder if these anonymous calls don’t prompt the squandering of city services. I wonder: When should we call to report neighbors, when should we talk with them directly, when should we join forces and work together? If you want to talk about neighborhood cooperation and how neighbors can work together, come see me in the garden. I’ll be pulling weeds and cussing under my breath, but very glad to see you. Self-appointed 'guardians' scare me almost as much as the perpetrators of vandalism and violence.